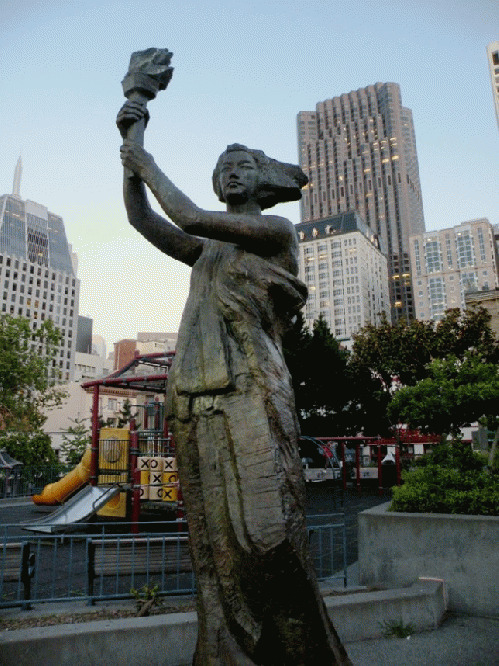 A statue at dusk in Portsmouth Square in Chinatown, which leads to the Chinese Cultural Center a few hundred yards away. Some of the ornate Chinese architecture in Portsmouth Square. Looking east we see the tall Chinese Cultural Center immediately beyond the gate, slightly left, and then the TransAmerica Pyramid rising above that. In the distance farther south are several more sky-scrapers of the ritzy financial district, intersected by famous streets like Montgomery, Sansome, Kearny and Battery, where vast transactions have occurred over the decades. But our target tonight is Chinatown, such as this scene. Stores and restaurants stay open pretty late in Chinatown. After walking a few blocks, I ran across the Chinese version of street musicians, a small and intense orchestra enlivening the air with traditional Chinese music. Fascinating! Chinese instruments are unique to the West, and their musical scale is different too. Notice how ornate some of the instruments are. Our mild-mannered instrumentalist. She may be a business executive by day for all I know.